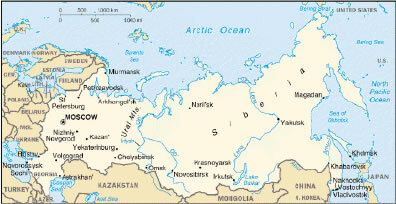 The Russian Federation has over 150 million people, and covers an area of greater than 6,592,800 sq. mi. The country has gone through many changes in recent years, as communism ended in 1991. At that time, the U.S.S.R. as it was called, separated into independent states. This separation ended the communism reign that had lasted from 1917 to 1991. Negotiations with Russians often involve flared tempers. During negotiations and meetings, temper tantrums and walkouts often occur. After the break up of the old Soviet Union, fifteen new independent states emerged. This number, however, is ever changing as boundaries are continually being modified. Businessmen in Russia usually wear suits that are dark and well tailored along with good dress shoes. A businessmans wardrobe demonstrates the individuals image as a professional. Men often do not take off their jackets in negotiations. Do not stand with your hands in your pockets. This is considered rude. Women dress rather conservatively, avoiding overly flashy or gaudy outfits. Women should always cover their heads when entering into any Russian Orthodox Churches. Skirts should be worn rather than pants. When attending dinner in a citizens home, casual dress of slacks and a nice shirt without a tie are appropriate. As a foreigner, you are expected to be on time to all business appointments. However, your Russian counterpart may be late, as this may be a test of your patience. Do not expect an apology from a late Russian, and do not demonstrate any kind of attitude if your business appointments begin one or two hours late. This may also be a test of your patience. Social events are more relaxed. It is acceptable for foreigners to be 15 to 30 minutes late. Patience is an extremely important virtue among Russians; punctuality is not. Russians are known as great "sitters" during negotiations, this demonstrates their tremendous patience. The U.S.S.R. was officially an atheist nation in the days of communism. Now, however, participation in religion in increasing, with many citizens practicing Protestantism, Islam, Russian Orthodoxy, and Judaism. Some 'hard-line' Russians still view compromise as a sign of weakness, and often refuse to back down. To these individuals, compromising is bad business. As a foreigner, you should realize that "Final Offers" are often not actually the end of the negotiations, and that often times the outcome will be more beneficial and attractive if you can hold out. There is a Russian term meaning "connections" or "influences. It is extremely difficult to do business in Russia without help from a local. To help with this, gifts, money or other items are often a good idea when doing business in Russia. If attending dinner at a family residence, it is appropriate to bring a gift, such as a bottle of wine, dessert, or a bouquet of flowers. When shaking hands with someone, be sure to take off your gloves, as it is considered rude not to. When attending any formal engagements such as the theatre, it is appropriate to check your coat and other belongings at the front door of the establishment. Do not show the soles of your shoes, as this is considered impolite. They are considered dirty, and should never come in contact with any type of seat (like on a subway or bus). Be sure to have plenty of business cards with double sides of information. One side should be printed in English, the other side in Russian. Be alert and open to taking a drink or having a toast, as refusing to do so is a serious breach of etiquette. Russian is the official language. Speaking or laughing loudly in public is considered rude, as Russians are generally reserved and somber. Many Russians speak English, as it is often taught beginning in the third grade. Russians are highly literate, and have almost a 100% literacy rate. Good topics of conversation include peace, the current changes taking place in Russia, and their current economic situation.